According to The Office of National Statistics, 1 in 7 families in the UK have three or more dependent children. That may not seem like a lot, however this means there are still a huge 1.1 million families in the same situation as I am and struggling to find holiday options as a family of 5! Many hotels are geared towards two adults and two children and when pricing holidays abroad we are often forced to choose two inter-connecting rooms which can work out rather pricey. It honestly is a real struggle especially when the children are young and you don't really want them to stay in their own room. I thought I would put together a post featuring some of the holiday's we have enjoyed that have catered for five people in one room. Camping is an obvious option - as our family has grown we have swapped traditional camping for glamping (it is soooo much easier) but when Harry and Heidi were little we had an 8 berth tent and used to take the grandparents with us. As mentioned, we are now much more likely to go glamping than camping and bell tents like these ones at The Bells of Hemscott) are usually big enough to sleep 5 people. Wigwams usually cater for up to 5 people and are very reasonably priced and a real adventure for the family. Often they will come with an electricity supply, lighting and heating and you have to take your own bedding. Not the most luxurious holiday you'll ever have but it is an option if you like your home comforts. 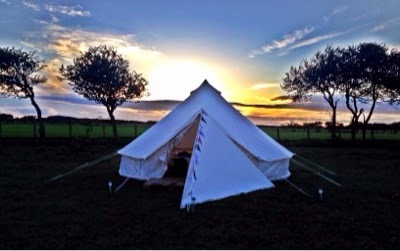 Check out our wigwam holidays at Springhill Farm in Northumberland and Hilly Cow near Edinburgh. In keeping with the 'glamping' option, large yurts generally sleep up to 6 people and can provide a cosy way to get close to nature. There are sites up and down the country but we have a particular soft spot for WestWood Yurts at Gibside. A few years ago I discovered roomfor5.co.uk which is a website specialising in accommodation for families of 5+. I loved the look of The Paddock in Henley on Thames and it was a real bargain. 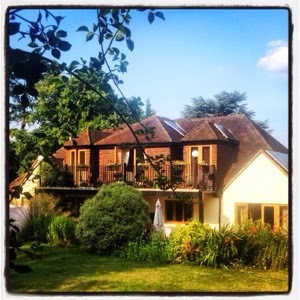 At £120 for 5 of us including a homemade breakfast in the Summer holidays it was very good value as we had a huge suite and use of a beautiful garden to ourself. I now use this website whenever I am planning a few nights away with the family. Most UK holiday parks offer accommodation for larger families. Our favourite has to be the absolutely fabulous family rooms at The Wave Hotel in Butlin's Bognor Regis - family rooms are actually two rooms joined together so it was fantastic having four bedrooms and two bathrooms. Center Parcs have plenty of options for larger families too and the New Style 3 bedroom lodges were perfect for us with just the right amount of space. We also have access to our in-law's caravan at Park Resorts. We have stayed here often and the kids love nothing more than staying at 'Grannie's Caravan' in the Summer. Another holiday option is to choose a 3 bedroom lodge at an independent site like this chalet at Calvert Trust, Kielder. One of our favourite breaks away was at Sanguli in the Costa Dorada. We travelled with Al Fresco holidays and stayed in a luxury 3 bedroom caravan with our own decking and access to some fantastic facilities on site. It was lovely to be able to enjoy a nice meal and entertainment in the evening and then pop the children to bed whilst we shared a jug of sangria on the decking. There aren't too many companies that offer 5 berth cabins but we are pleased that DFDS Seaways are one of them. They sail directly to Holland from Newcastle and our children loved their triple bunks when we sailed over Easter. So, as you can see there are actually a fair few options out there for families of 5 (in fact there are more than I considered). We have a few more options we'll be trying out this summer so will update this post when we do. I would love to hear from other families of 5 and find out what holidays work for you? Oh the joy (not) of finding a suitable holiday for a family of 5! I find it so annoying that most hotels only cater for 4 and don't always have the option of interconnecting rooms. Especially Travelodge & Premier inn, you would think they would have an extra option for larger families! We usually either camp or hire a caravan. Yes it has saved me many of times! We stayed in a super fun Holiday Park in New Zealand. Great suggestions! This is a very interesting point... I never thought about how much work and money is needed to travel in 5. When I was a kid my parents and my 2 sisters never did a big trip the 5 of us, so I don't really know how is it like to plan such trips or how much they would cost. Today, knowing how much effort and money I spend on my trips for my husband and my dog, I can only imagine that it might be difficult to organize the entire thing. I am happy to know that it is possible and that there are great options for you guys. This website you found seems like a great idea!! We're a family of 6 and it's so expensive as majority of places cater for 4. So ... if anyone can advise us of UK hotels that cater for 6? I would always recommend if a 2 bed apartment or villa looks spacious enough, email the owner and ask if they can add a third bed to the second bedroom, even if it's just a camp bed. We've done this many times in order to fit the three children into one bedroom, and most owners are happy to oblige, in fact they've told us it's a fairly common request. Sometimes they charge a small supplement for it, which i think is fair enough, and still cheaper than booking a bigger apartment! I know this is an old post but... airbnb's are great for larger families!! !